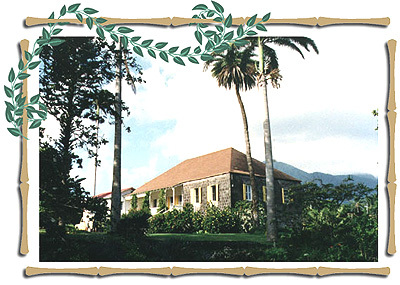 The Glory Days of Sugar Revisited"
This exciting St Kitts sugar plantation safari drives up into the mountains from the placid Caribbean coast stopping initially to visit Shadwell Great House, a private, Sugar Plantation Home built in the mid 1700's. Following a short walk around the grounds the Jeep Safari continues through sugar cane fields, quaint rural villages and eventually the cool mountain rainforest arriving at a panoramic mountain top view, 1100 feet above the sea. Here you will experience a not to be forgotten "birds eye" view out over St. Kitts, as well as a delicious island picnic of exotic Caribbean fruits, freshly baked pastries and homemade juices. 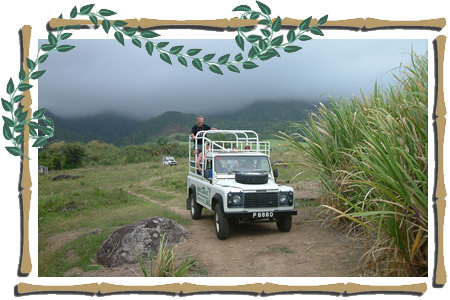 The Caribbean 4x4 Jeep Safari then travels down from this mountain top view back through a lushly forested valley to reemerge at the rainforest edge, in swaying fields of sugar cane from where there are spectacular views down over the windswept Atlantic coastline of St. Kitts. After driving a short distance from the rainforest edge, the St Kitts sugar plantation tour stops to visit the fascinating ruins of an old "Muscavardo" Sugar Factory. 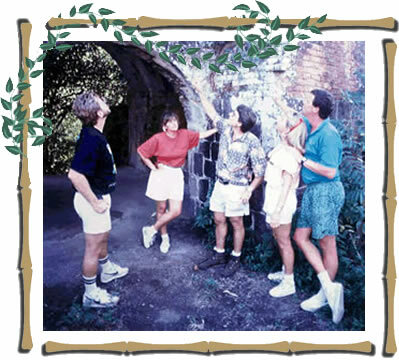 You will tour the ancient sugar factory ruins on foot, exploring its picturesque old Windmill and Boiling House while hearing fascinating stories about sugar cane cultivation on St. Kitts and how brown sugar, molasses and rum were produced here in colonial times. The St Kitts sugar plantation jeep safari then continues down from the mountains towards the Atlantic coast eventually stopping to visit with another "privately owned" old Sugar Plantation home. At this beautiful historic landmark you can enjoy a walkabout of its stunningly landscaped gardens and visit its antique filled old Sugar Plantation Great House built in colonial times. The stop at this Sugar Plantation Great House lasts about 30 to 40 minutes. From there the sugar plantation tour continues back to the starting point by traveling along the windswept Atlantic coast road, never to repeat the route used on the way out. 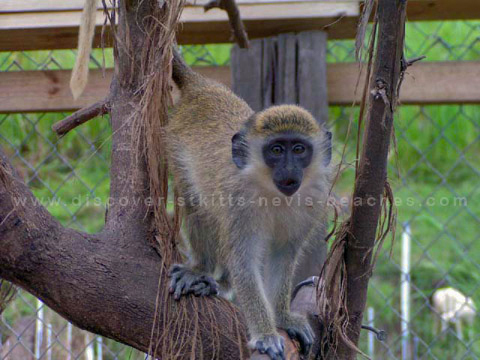 A not to be missed 4x4 driving adventure to have an up-close look at the Sugar Heritage of beautiful St. Kitts as well as an unforgettable "off the beaten track" photo safari. Cancellation Policy:	Final tour numbers to be provided at least 12 hours in advance. 50% cancellation charge if cancelled within 12 hours after the final numbers are received. If you have questions about this off the beaten track St Kitts Sugar Plantation Tour or would like to book this tour please complete the tour booking enquiry form.